A view of the fire from Mill Street near Bede Terrace. Photo by Jim Lawless. 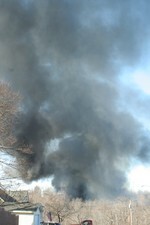 A view of the smoke filtering over Route 9W. Photo by Jim Lawless. Smoke above Hudson Street in Cornwall-on-Hudson. Photo by Jim Lawless. The smoke from the fire seen from Ridge Road. Photo by Jim Lawless. The smoke covered Cornwall. Photo by Walter Moran. Debris fell on people on Canterbury Lane, where this photo by Maureen Moore was taken. Jim Lawless , Maureen Moore and Walter Moran took these photos of the fire Sunday morning that engulfed a large warehouse in the rear of the Cornwall Industrial Park at 2 Mill Street.